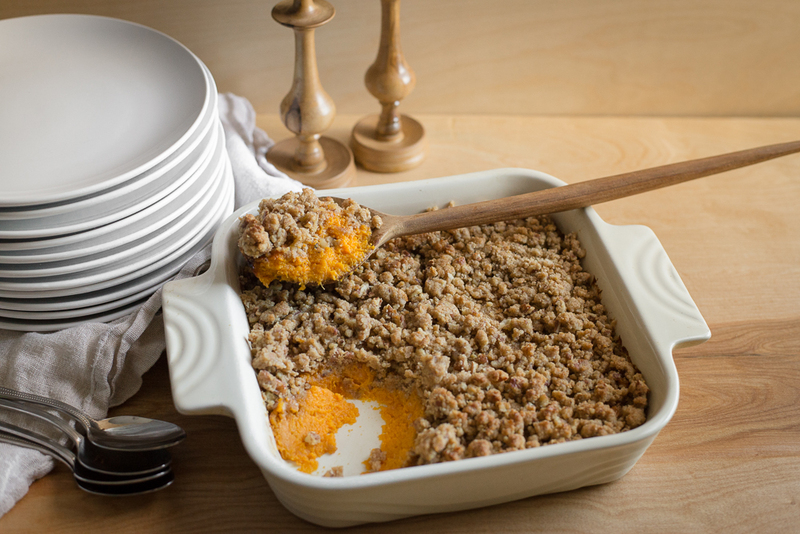 Sweet potato casserole is a favorite at our house at Thanksgiving. Every once in a while I will make this as a side dish, but the original recipe was far more decadent. Finally I decided to make it healthier so we can enjoy it more often. I took some of the fat and sugar out of the casserole, and the topping has less butter and more nutritious ingredients. Sweet potatoes are a great source of fiber, Vitamin A and Vitamin C. The topping adds more fiber, omega 3 fatty acids and other nutrients. To make this recipe gluten-free, omit wheat germ and use a brown rice flour or other gluten-free flour substitute. Wash and peel sweet potatoes and cut into large chunks. Place in a pot over high with water and bring to a boil. Lower to simmer until potatoes are fork tender, about 30-40 minutes. Preheat oven to 350 degrees. Drain water and place in a mixer or food processor. Beat or pulse until smooth. Add brown sugar, milk and egg and mix until combined. Place in a 9×9 baking dish or small casserole dish. In a medium sized bowl combine all the topping ingredients with your hands, creating a crumble by breaking apart the butter. Sprinkle topping on top of the sweet potatoes. Bake in the oven about 25 minutes. After boiling sweet potatoes, purée and set aside a portion for baby. This is a great "Stage 1" food. A more advanced eater who has already been exposed to egg can be served the finished casserole without the crunchy topping.